Contents and Media: Resin parts with white metal landing gear, vacform canopy and markings for two options. Conclusion: Expensive but very welcome, and high quality to match the price tag. The long-lived Grumman “Albatross” series of amphibians, the first of which flew in 1947, has become almost as iconic as the Douglas DC-3/C-47. Retired by the Air Force in 1973–HU-16Bs rescued 47 airmen from hostile waters of the South China Sea, with the loss of four birds and nine crew members-- and ten years later by the Coast Guard, the Albatross is still in use throughout the world by other governments and private parties. Initially-produced Albatross A models were soon supplanted by the longer-spanned (roughly eighteen additional feet) Bs. Lift greatly improved, as did handling, when horizontal and vertical tail surface area was also increased. 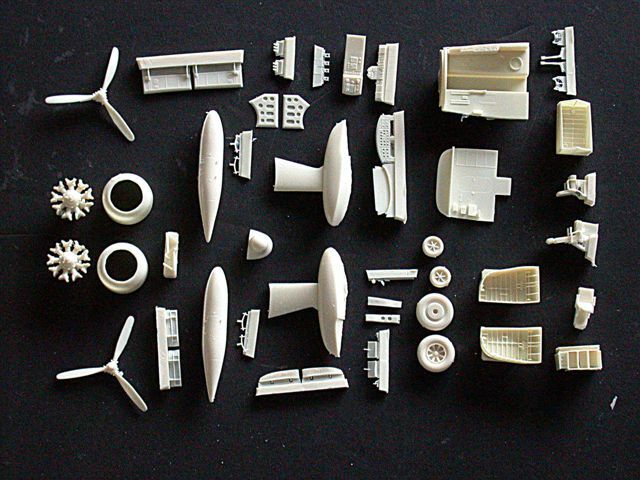 It has been roughly four decades since Monogram first released their 1/72, silver plastic, raised-rivet, retractable gear kit but, for its time, it could be built into a quite decent model (if the rivets were suitably leveled!). 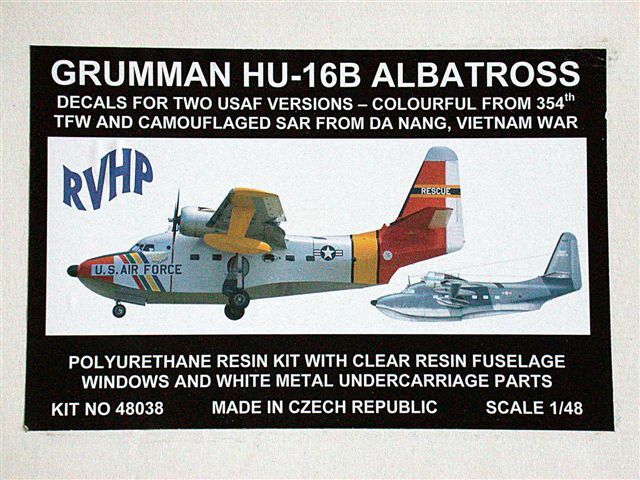 At least two years ago, RVHP in the Czech Republic announced a forthcoming 1/48 Albatross series, but when nothing materialized, the initial excitement faded, and your correspondent sadly assumed we were talking vaporware; I’m sooo happy I was wrong, because just a month ago the first shipment of HU-16Bs arrived at David Cooper’s DMC Models and sold out in short order. RVHP says that at least three other versions of the type will be produced. Overall, the glossy, extremely smooth castings, engraved with delicacy that equals the best injected kits, reminds me of kits done by Planet, interestingly an outfit also from the Czech Republic. Very little, if any flash is present, and that is paper thin. Warpage in my kit is confined to one of the outboard solid resin wing sections. It’s a slight bend downward; nothing that very hot water can’t fix. The large fuselage halves are nicely hollow-cast, as are the wing center sections and integrated engine nacelles. All details are crisp. The horizontal stabilizer is one-piece, with appropriate dihedral. I tried major sections and some cockpit components; all seems very good. Single-row Wright R-1820s are cast in one piece, and have cast-in spacers to insure accurate placement in relation to the firewall and cowling. Two individual three-tube exhaust stack castings are glued into each nacelle top. The diameter of the exhaust tubes seems to this modeler to be on the small side; I might refit with small-diameter stainless tube. Three-piece cast metal main strut assemblies have the usual small protruding seams, easily filed off. Same, same for two-piece nosegear. Resin gear doors are appropriately thin and detailed. Main and nosegear wells are exceptionally well-detailed and cleanly cast. Consists of well-molded main tub with separate rear bulkhead, equipment rack and main and overhead instrument panels. A/C and co-pilot seats have delicate armrests and support struts, but no seatbelts/harnesses. The third (ASW) crew member seat is of a different design, as per drawings in the authoritative Steve Ginter Albatross book. The control yokes are very delicately done, but will require extreme care to separate from the sprue. 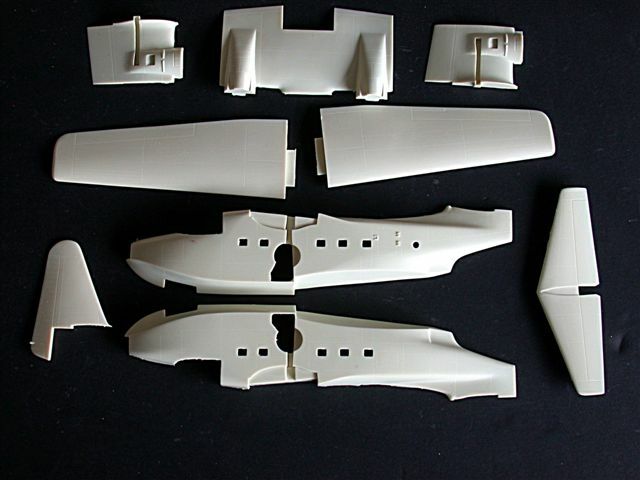 Outer wing sections are solid-cast, and probably that’s why there was some spanwise warpage. RVHP has included the correct undercamber in the leading edges of said outer sections of the B wings (the undercamber was incorporated into Bs, replacing slats in the A models. All trailing edges are very sharp, as they should be. It’s a real downer to have to shave the trailing edges of some other resin manufacturer’s releases. Wingtip floats and pylons are single assemblies, and the external fuel tanks have separate, very delicate, mounts. The canopy (two copies included) is vacuformed in some of the thickest stock I’ve seen, about 3/32"! At the same time, the plastic is exceptionally clear and free of visual discrepancies. Side windows are cast in clear resin and are somewhat cloudy. Buffing and Future should help bring up the clarity. Two marking options are offered: a very colorful 354th TFW rescue bird and a muted workhorse SEA SAR version. One large and two smaller decal sheets (all decals are numbered) are very sharply printed (AVIPRINT), with excellent registration and vivid colors. Distinctive Albatross walkways are also included. Two 8 ½” X 11" sheets comprise the whole shootin’ match. One sheet has a half-page history and a small parts layout. The exploded assembly layout on the back is hand drawn, but perfectly usable. The second (markings) sheet, although in B&W, has nice three-views (both schemes) with color and decal callouts. 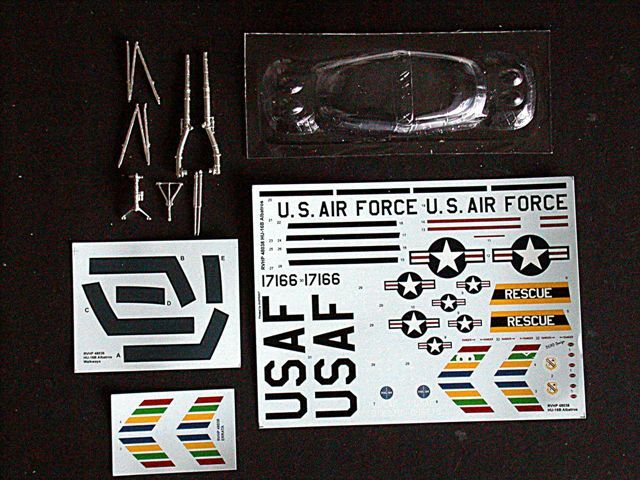 The eagerness of the modeling community to receive this very-long-awaited kit is evidenced by its quick sell-out by U.S. distributor, DMC Models, even at the righteous buck ($266) price. For those who didn’t get in on the initial feeding frenzy, do not despair; more kits are on the way soon. My feelings for this release are overwhelmingly positive: excellent mastering, super smooth hollow casting. The Czech modeling elves really have their act together!